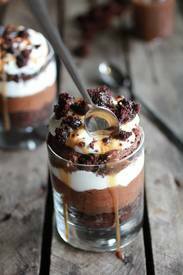 Triple layer coffee caramel chocolate mousse cakes! OK Chocolate Coffee lovers, have I got the dessert for you! Happy National Chocolate Caramel day! So, there are alot of layers in these,You have the super moist chocolate cake layer that is, wait for it……Soaked in Kahlua. Yes, soaked. It is amazing. Then there is the chocolate coffee caramel. It is chocolate caramel sauce, spiked with Coffee. It’s kind of crazy. Then the mousse. The best part. It’s light and airy and I just cannot get enough of it. Top it all off with some fresh whipped cream. You know, to balance out all the chocolate! These are the perfect party dessert since everyone can get their own and you do not have to make them as big as mine. Just find some smaller serving dishes and divvy up all the layers equally. Or to make this crazy easy just grab one giant bowl and make a trifle, those are always stunning! Either way you go, just make all the layers. Every last one brings something awesome to the table and trust me, you just do not want to miss out on any of the awesomeness.